From humdrum to lovely in one style or less! I am extremely pleased with the look of my new ceiling!! After looking around at the terrible looking ceiling tiles available to me locally, I decided there had to be something better and searched the Internet. After finding your site, I was very excited and couldn't wait to see the actual tiles. My builder and I were very impressed with the sample tiles when they arrived, and I placed my order immediately. Your salesman was courteous, the samples and the actual tiles arrived in a timely fashion, and the product is beautiful. 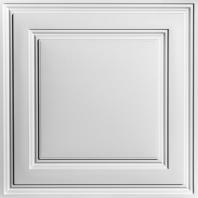 I would recommend Ceilume tiles to anyone who has a drop-in ceiling- your tiles make a humdrum ceiling into a lovely ceiling!! In addition, everyone who has seen my new room - from contractors to inspectors to friends- has loved the look of your product. I would rate your product a 10! !